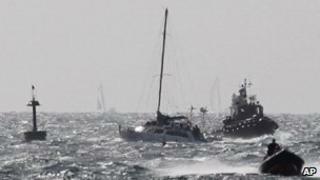 Image caption Israel says it intercepted the Irene "without incident"
The Israeli military says it has taken control of a boat carrying Jewish activists to the Gaza Strip and is towing it into an Israeli port. Israel had promised to stop the Irene, which was trying to breach a three-year naval blockade of Gaza. Earlier this year, Israeli commandos killed nine people in clashes on board a Turkish ship trying to reach Gaza. Israel says its blockade is designed to prevent weapons being smuggled to Hamas militants who run the territory. Israeli naval forces boarded the Irene "without incident" on Tuesday morning some 20 miles (30km) off the Gaza coast, the military said. Naval forces were towing the boat to an Israeli port, it added. Earlier, organisers of the voyage said the 10m (32-foot) catamaran was being blocked by an Israeli warship and trailed by several smaller boats, including one with machine-guns mounted on the front and back. The boat set sail from northern Cyprus on Sunday, carrying medical equipment, textbooks, fishing nets and children's toys. The voyage was organised by the London-based Jews for Justice for Palestinians. On board were 82-year-old Holocaust survivor Reuven Moskovitz and Rami Elhanan, an Israeli whose daughter Smadar was killed by a Palestinian suicide bomber in Jerusalem in 1997. Others included a German nurse, British and US peace activists, and an Israeli reporter. Prominent British supporters listed on the group's website include actor Stephen Fry and Marion Kozak, the mother of the newly elected Labour Party leader Ed Miliband and former Foreign Secretary David Miliband. Israel had warned that if the boat went within 20 miles of the Gaza coast, the navy would intercept the vessel and divert it to the nearby Israeli port of Ashdod, from where it would inspect and deliver any approved humanitarian cargo to Gaza overland. Israel and neighbouring Egypt shut down Gaza's border crossings when an Israeli soldier was captured in June 2006, and tightened it further when the Islamist Hamas movement gained control of Gaza a year later. Israel began allowing consumer goods into Gaza after its May raid on a Turkish aid ship sparked international outrage. Nine activists were killed when Israeli commandos intercepted the ship in international waters. But it still blocks all exports from the territory, imposes a complete naval blockade, and severely restricts the movement of people.